The recently concluded Mobile World Congress in Barcelona, Spain, did see a fair number of smartphones unveiled for the masses, and it would be interesting to see how the smartphone landscape will play out in due time when all the different players release their products onto the market. LG, a staunch supporter of the Android operating system, they decided to launch a trio of smartphones from the L-Style line – and the Optimus L3 would be the first model from this particular range, so let us take a closer look at it. Arriving in Europe later this month, the LG Optimus L3 will deliver an authentic experience that brings together both style and practical technologies into a single package. L-Style’s elements, including Modern Square Style and Harmonized Design Contrast with metallic accents, and you can be sure even if this smartphone falls under the budget market, it is not going to look the part. 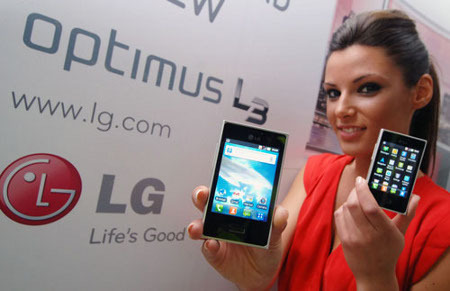 Once it arrives in Europe, the LG Optimus L3 will then continue its march across Russia and Asia, with the other worldwide markets to follow thereafter. Just to refresh your memory, the LG Optimus L3 will be powered by an 800MHz processor, featuring 1GB of internal memory, 384MB RAM, a 3.2″ QVGA touchscreen display, a 3-megapixel camera at the back, and running on the Android 2.3 Gingerbread operating system. I am not sure whether Android 4.0 Ice Cream Sandwich is in the works for this puppy or not though.